“Steven Furtick’s financial empire was built with BLOOD MONEY — money earned twisting God’s Word, preaching false doctrine & deceiving people IN THE NAME OF JESUS.” – Chris Rosebrough, 23/10/2013. Could the same be said of Phil Pringle of C3 Church and Brian Houston of Hillsong Church? In the last few months, people have been hassling or giving us links to report on the lavish lifestyle of Phil and Chris Pringle, Senior Pastors and Founders of the C3 Church Movement. The Pringle’s recently purchased a $3.5 million house and had no problem flaunting their lifestyle on twitter or instagram. My! What Big Faith You Have! My! What Big Stories You Have! It’s been reported in the past that Brian Houston and his wife Bobbie have property deals of up to $1.4 million and that they are tenants of waterfront properties at Bondi Beach and the Hawkesbury River that they sold to LMI. Not to mention, it was reported that Houston said his total salary was “just over $300 000″. Just recently, Steven Furtick (close associate of Phil Pringle and Brian Houston), has come under scrutiny over his $1.7 million house and his CEO approach to church ministry. Before looking at some news articles, we thought it would be good to provide an article and some links from the Pajama Pages blog on this issue. After reading the Pajama Pages articles, we have media articles reporting on Furtick’s mansion. We hope these articles help you understand the nature of how mega churches like C3 and Hillsong run. The problem with Furtick isn’t that he’s rich, or even that he’s a rich pastor. The problem is that he’s rich because he’s a pastor. If professing Christian Steven Furtick started a successful bakery, retail store or construction company in 2006 that was incredibly successful, so much so that he could buy a $3 million home, few would criticize him for enjoying his earnings. 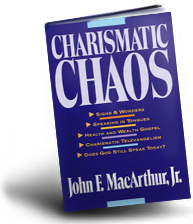 In fact, the world and people in the church generally look favorably on successful Christian businessmen. No one questions how Truett Cathy spends his Chick-fil-a money, for example. 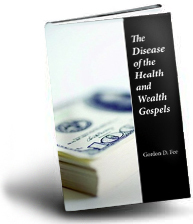 The problem is that Furtick and others got their money by turning the church into a business. Pastors like Furtick are obsessed with business leadership because they fashion themselves as the CEO and identify more with celebrity CEOs like Steve Jobs than with non-celebrity pastors. Decisions are made by the CEO to build the brand, to create a larger customer base, to increase the giving margin, and to expand into new opportunities. Church personnel decisions are made in the same way. Is the youth pastor growing the youth brand? Is the worship pastor stylish enough? While such decisions are constrained at some point by biblical considerations…they aren’t going to hire a guy who publicly rejects the Bible…the biblical standards of Titus 1 and 1 Timothy 3 aren’t really considerations. This creates two problems, though. One, churches aren’t businesses and aren’t supposed to be run as such. There is nothing wrong with Macy’s developing a non-fraudulent pricing and promotional strategy designed to extricate consumers with as many spending dollars as possible. Macy’s should offer products and services designed to produce high margin income. But churches aren’t businesses. The pastor shouldn’t spend time developing (or, more likely, purchasing from consultants) “offering talks,” or message series, or coaching services, or conferences with a goal of increasing the church’s income. The church shouldn’t be selling books and t-shirts and lattes and Bibles or anything else. God’s house is not a house of merchandise! So when the Furticks of the Christian world stand up and talk about money (and they talk about money a lot!) it sounds a lot like Macy’s running television commercials for their two-day After-Thanksgiving sale. When they preach on tithing (a subject on which Bible-believing Christians can easily disagree), it sounds self-serving because it is self-serving. 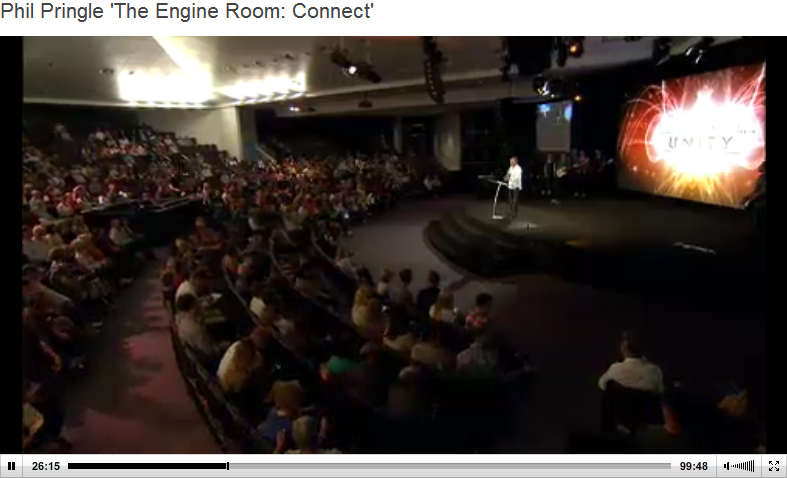 Is it Furtick the preacher of God’s Word talking, or Furtick the CEO of Elevation Church, Inc. talking? Nothing has changed in two thousand years. A pastor cannot serve two masters. The second problem is the conflict of interest between the company (the church) and the CEO (the pastor.) Former GM CEO Charles Wilson reportedly once claimed that “What’s good for GM is good for the country.” (A misquote, but that’s not the point here.) Celebrity CEO pastors seem to believe that what’s good for the Lead Pastor is good for the church. That’s why they freely write and promote books on the church’s time and bring in other celebrity CEO pastors to “teach” (with undisclosed and sizable speaking fees). Does Furtick invite Craig Groeshel to teach for $____ because Groeshel brought in Furtick to teach at Lifechurhc for $_____? No one knows because it’s all a big, big secret. Is the five-week sermon series on “Sun Stand Still Prayers” for the edification of the church, or to promote the CEO’s new book, which is conveniently for sale in the church bookstore. Building the CEO’s profile will help him sell books, increase his demand as a guest speaker, and feed his ego. But does it benefit the church? None of your business. 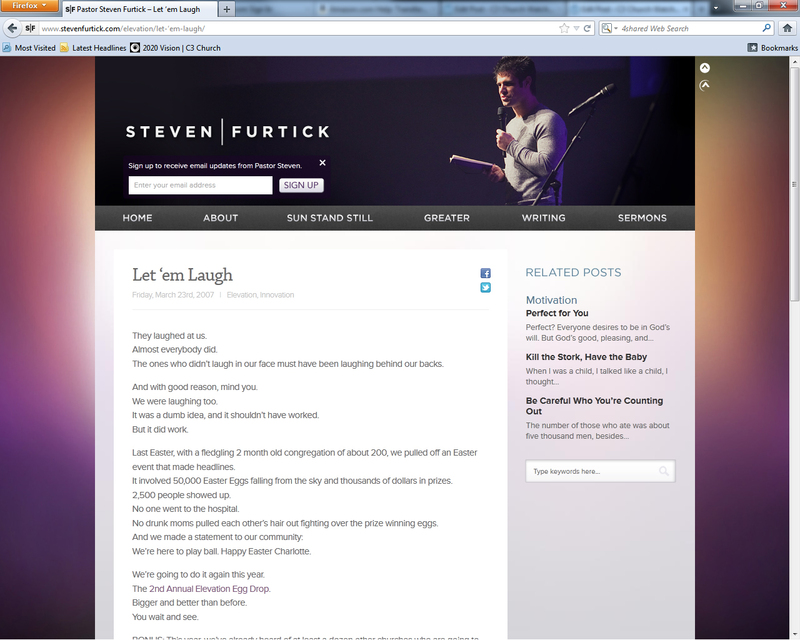 Here are some follow up articles on Steven Furtick you can read up on. Any more articles that are found on this issue, we will gladly add. What Do Phil Pringle, Steven Furtick and Kong Hee Have In Common? Answer: They’ve all been reviewed and validly critiqued by Chris Rosebrough on his program, ‘Fighting for the Faith’. They’ve also spoken together at Pringle’s C3 Presence in 2012. Recently, Chris Rosebrough reviewed the false teachings of Kong Hee, Phil Pringle’s protege. In 2011, Steven Furtick stated that he sees Phil Pringle as a valid prophet of God and an inspirational friend and leader. Chris Rosebrough also in this episode reviews Steven Furtick’s response to the stories about Furtick’ new million dollar property. NOTE: The resent sermon that Kong Hee delivered is a rip off of a sermon he gave at the C3 Presence Conference back in 2011. 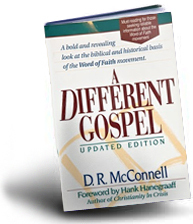 You may like to compare the two sermons. Visit Fighting for the Faith now or click the below link to download the radio episode. Since the C3 Presence Conference 2013 is on this week, we thought it might be wise that Christians discern what is being said in the name of God to the Word of God. If C3 Presence Conference is anything like the last few years, you will not be getting anything that resembles biblical Christianity. For this reason, we would like to provide our listeners with this fantastic resource so you can see through the lies of Phil Pringle, Chris Pringle, Steven Furtick and the notorious Kong Hee. If you are planning to attend the C3 Presence Conference, hold on to your bible, your mind and your wallet at all cost. “Based on the performance I have that I’ve seen… I think it is safe to say that Steven Furtick is a cult leader. I know that might come as a shock to some of you but I mean, based on what his followers have been saying to me privately and pubicly on twitter as well as in email and other stuff like that- I mean this guy is a cult leader. He is the visionary. He’s the man of God. He’s the new Messiah. But he’s not.” – Chris Rosebrough, The Antidote to Antichrist’s Anti-Truth: 08:30,http://0352182.netsolhost.com/F4F012012.mp3, 20/01/2012. Phil Pringle however has invited the “Word of God” to come back down to preach at his Presence Conference. 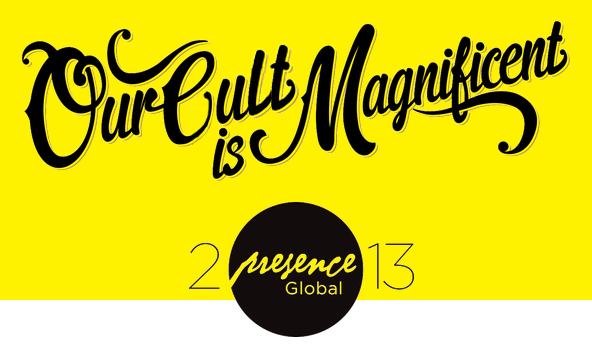 Presence Conference 2013 Website, Accessed 04/08/2013. Let’s hope that Phil Pringle does not copy this idea from Steven Furtick. Elevation Church and Steven Furtick: Volunteer to Be Sued! Contrary to popular blogger belief, TWW does not need to “go looking” for controversy. We have been around for 4 years and have developed a reputation that we give a hoot about people who have been hurt, let down, and abused by churches. The church leaders have their fan clubs of admiring wannabe pastors and church leaders. They pay the dough to sit in their presence at the interminable conferences held in nice places all over the world. Who is the fan club for those hurt by these churches and leaders? Well, TWW is one. Julie Anne Smith at Spiritual Sounding Board and Kris at SGM Survivors are others. All of us raise red flags to help people know about church settings that are optimized for potential abuse. This past week we got an email from an individual who referred to a contract that volunteers, as well as church employees, must sign at Elevation Church. This individual went onto to call this document a pile of codswallop (or something similar).Frankly, I agree. TWW has written a number of posts outlining the potential pitfalls of signing membership covenants. Here are a few. When signing one of these “covenants,” potential church members should understand that they are signing a legal document. We are warning you: these documents have been vetted by church attorneys. The pastors go all “nicey, nicey” on the likely member, explaining that this is simply a “biblical” way to demonstrate that one is committing oneself to praying for, and supporting, the local body of Christ. Then everyone joins hands and sings “Kumbaya” while reveling in the loving unity of the local body. That is, until an unsuspecting person asks the wrong question and finds themselves on the receiving end of some “loving” church discipline with little recourse. Said person can run but the church can legally report them to the next church (and they do). Please refer to this post on TWW on how to legally extricate yourself from an abusive church. If you insist on signing a church contract, consult your own attorney. These covenants were invented by lawyers to protect the church leadership, as well as the church assets, from liability. These are not meant to protect you. (Repeat 10x).What makes this practice particularly despicable is that prospective members are rarely advised that they are signing a legal document or that they should consider getting legal advice prior to signing it. We have often said that smart people should not sign these documents without first consulting with their own (not the church’s) attorney. Better yet, they should ask themselves why they would join a church that would not tell them that they are signing a legal document. Is paranoia a biblical value at Steven Furtick’s Elevation Church? Deb and I wanted to visit Elevation Church and listen to Furtick speak in person. We called the church office to ask when and where he would be preaching because there are multiple campuses. But, they have a funny little rule. 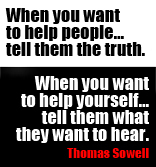 They won’t tell you. It is against the rules. No matter which way I asked the question, the administrative person refused to answer me. Is this paranoia? Sure seems like it. The infamous volunteer/employee contract is gaining fame. The following document has been making its way around Charlotte, NC and has been picked up by Stuff Christian Culture Likes on Facebook link. It is a confidentiality agreement that must be signed by employees and anyone who wishes to “volunteer” at Steven Furtick’s Elevation Church in Charlotte link. Some smart folks, knowing that such a document might tend to “disappear” (imagine that!) made sure to post it on Dropbox here. (It takes a few seconds to load). Here is most of the document. You can view the whole thing at the above link. I have highlighted a few things. I also introduce each section. It’s all about gossip and slander but these terms are not defined. Note the legalese. ________________________________________ (referred to as “I” or “me” below). WHEREAS, as an inducement to the Church to allow me to volunteer, or to hire me or continue to employ me, or to provide me access to its confidential information, or to provide me compensation and/or benefits, as the case may be, I have agreed to execute this Agreement and be bound by its terms and covenants. They say you must disclose things if required to do so by the law but you must alert them immediately if you do so. Oh yeah, and be careful not to say too much. 1.1 Duty to Maintain Confidentiality. volunteering with the Church and thereafter: (a) I will keep strictly confidential and not disclose to any person not employed by the Church any Confidential Information, and (b) I will not use for myself or for any other person or entity any Confidential Information. However, this provision shall not preclude me: (i) from the use or disclosure of information known generally to the public, other than as a result of my violation of this Section; or (ii) from any disclosure required by law or court order, so long as I provide the Church immediate written notice of any potential disclosure pursuant to this subsection and take all reasonable and lawful steps to limit the extent of such disclosure. Of course, it is wrong to share prayer requests as you will note in (i). However, look at what else one must keep secret. created by me within the course and scope of my work (volunteer or otherwise) with the Church. Confidential Information includes,but is not limited to, such information relating to: (i) Church participants, including lists, contact information, prayer requests personal information; (ii) the Church’s finances, including personal financial/salary information related to the Church’s financial statements, balance sheets, offerings information, cash flow, forecasts and cost analyses; (iii) the Church’s plans and projections for opportunities for new or developing ideas; and/or (iv) the Church’s research and development activities and technical data. Then, one must agree that this is all very reasonable. I recognize that the terms of this Agreement are necessary to protect the Church’s confidential information and the sensitivity of such information. I also agree that its terms are fair and reasonable. Thus, I agree not to contest the general validity or enforceability of this Agreement. The covenants in this Agreement shall survive the termination or end of my employment or volunteering with the Church as set forth above, regardless of the date, reason or manner of my separation. I acknowledge that this Agreement is supported by good and valuable consideration. And, if you happen to mention that the church is thinking about offering Zumba in the sanctuary on Mondays, you can get your pants sued off you. 3.1 Remedies Available to the Church for My Breach. or threatened violation of this Agreement. I further agree that the Church shall not be required to post a bond to obtain such an injunction. All remedies available to the Church by reason of a breach by me of this Agreement are cumulative, none is exclusive, and all remedies may be exercised concurrently or consecutively at the Church’s option. Do not tell how much was in the plate on Sunday. People might wonder where the money goes. Do not share any cool idea that Furtick has. Someone else might copy it and that is not fair. 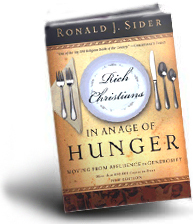 Why help another Christian church. Furtick wants it all. If you do any of the above, you can be sued. Well, I gotta hand it to him. At least he doesn’t play games with Matthew 18. He’ll just sue your sorry bottom. Do you really want to volunteer for a church that threatens you from the get go? Is this truly a place of love and unity? Ask yourself why Furtick wouldn’t want to share any neat ideas he has with everyone else? Or is he hiding his bundle under a bushel? You are the light of the world. A town built on a hill cannot be hidden. Neither do people light a lamp and put it under a bowl. Instead they put it on its stand, and it gives light to everyone in the house. In the same way, let your light shine before others,that they may see your good deeds and glorify your Father in heaven. Steven Furtick at his finest. Hey Hater! 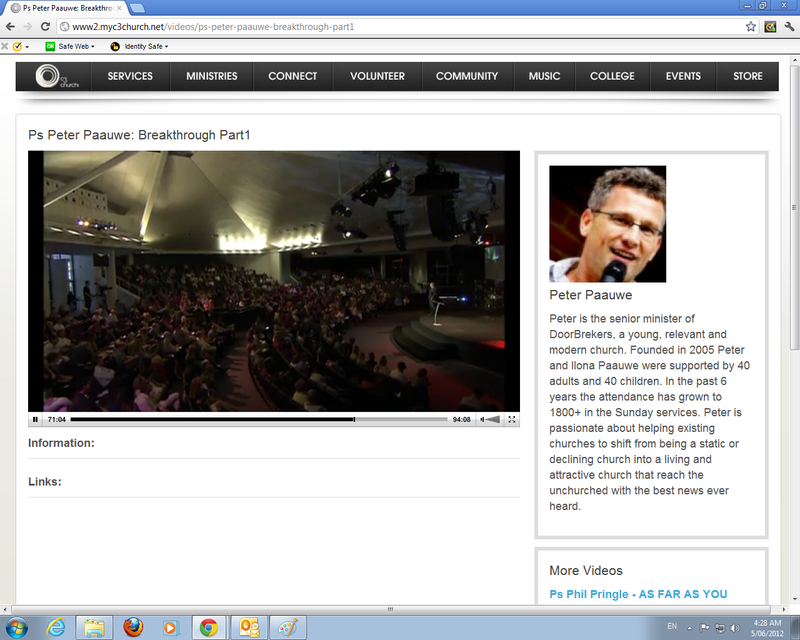 Credit goes to C3CW for getting me access to the footage from Presence Conference 2012. Cheers. 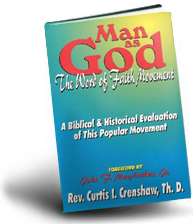 Here is my next review on the C3 Church movement. The theme of this review is ‘the price of a human soul’. I review Andrew Kubala’s statements at Presence Conference 2012, namely, that we can sow a financial ‘seed’ offering for the salvation of our loved ones. I point out that no amount of money can buy salvation, and that the redemptive price of a human soul is the blood of Jesus Christ ALONE shed on the cross. It is ONLY by Christ’s sacrifice that sinners are saved; this one offering accomplished salvation once for all and is never to be repeated. I received some positive feedback from my last video review and so I decided to record another. This particular review focuses on Phil Pringle’s negligence in allowing Kong Hee of City Harvest Church Singapore to collect the opening offering on opening night at Presence Conference 2012, all the while being under investigation for misuse of church funds, about which Phil Pringle was completely aware and yet failed to mention any of the relevant details concerning the investigations to those attending the conference and watching online via live webcast. I critique Kong’s offering talk wherein he twists God’s word to fleece the audience. Instead of getting the facts, the audience was fed a one sided propaganda piece, painting Kong as the victim and Phil Pringle as the hero who swooped in to save the day. As you watch this review, ask yourself: would the audience have been so willing to hand over their money at the conference if they knew that the man encouraging them to ‘give’ was currently under investigation for misuse of church funds? I don’t think so. This review will focus on Phil Pringle’s NEGLIGENCE in allowing all this to happen. Below you will find links to the news articles I play in this review. Before reading this article, please read Part 1, Part 2, Part 3 and Part 4. In Part 1, we encourage you to watch Pringle prophesy at the C3 Church at Oxford Falls, how revival was going to hit the building. In Part 4 we analysed the prophecy itself. In this final article, we will be looking to see if the prophecy was fulfilled at C3 Church Oxford Falls. In looking at the above quote, when Warragamba Dam was reported full, was revival immediate? 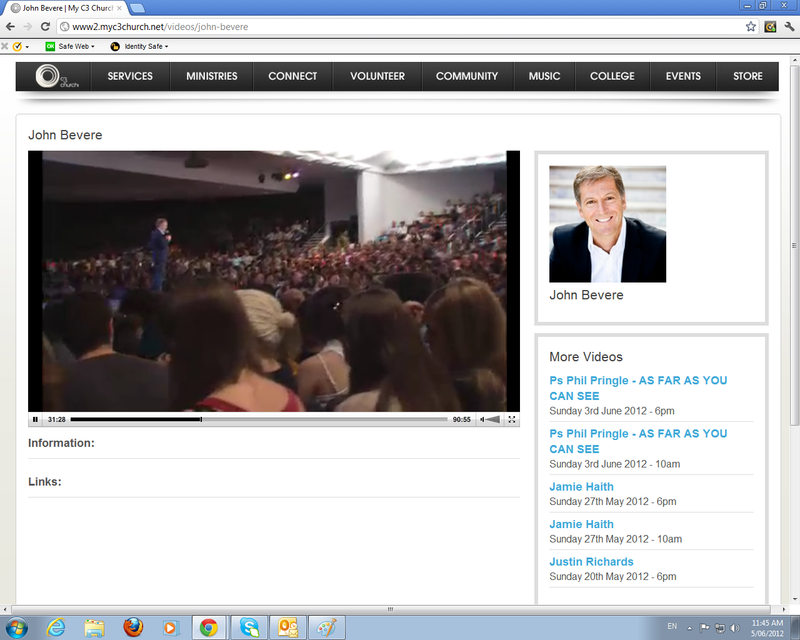 On the 4th of March 2012, Pringle preached a message titled Heartbeat – Servanthood. 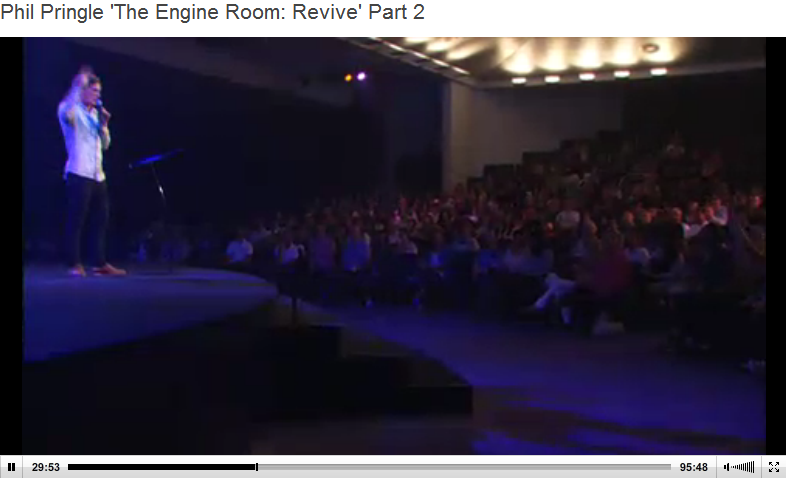 Their uploaded video showed us… There was no revival at the C3 Service. There is a LOT of seats behind Pringle. In that night time service on the 4th of March 2012, Mark Kelsey preached a message titled Heartbeat – Servanthood. C3’s uploaded video showed us… There was no revival. Drat! 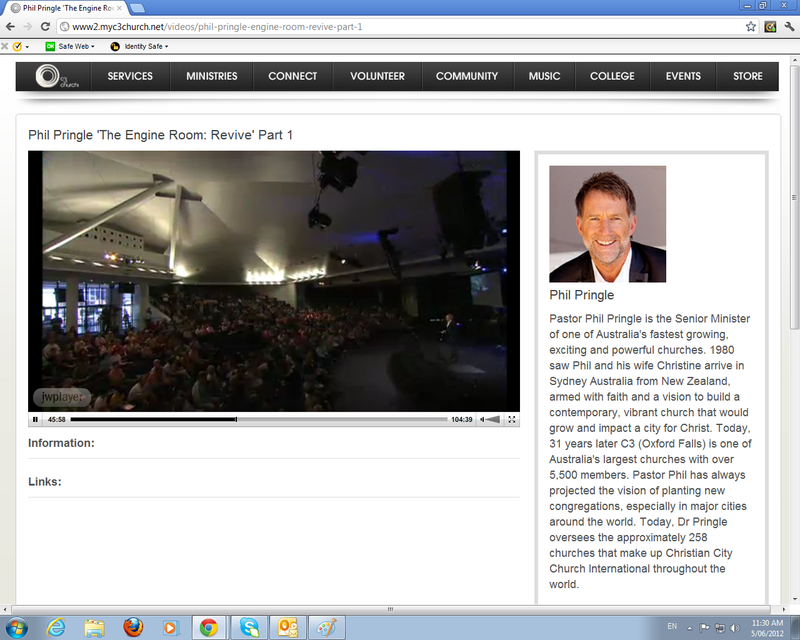 The following Sunday morning (11/03/2012), Pringle preached a sermon titled the The Engine Room. Was their a revival? Were there queues outside wanting to come into the house of God? What about that night service on the same day (11/03/2012)? 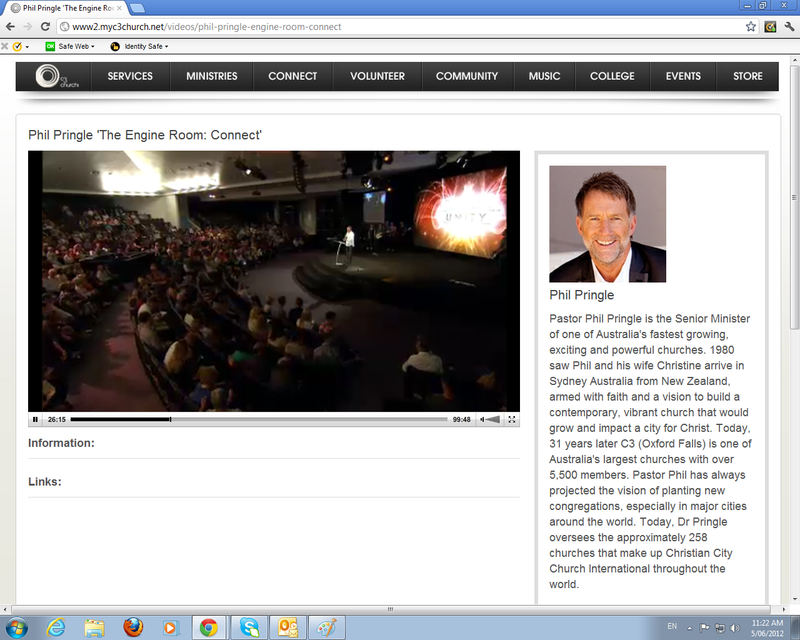 Pringle preached a similar sermon with the same name: The Engine Room. By now, this prophecy is already looking ridiculous. But just in case someone justifies from C3, “God’s ways are not our ways’, we must continue. Maybe, God was going to move that night? Nope. By this stage you may be thinking this is tedious. But we have to do this. 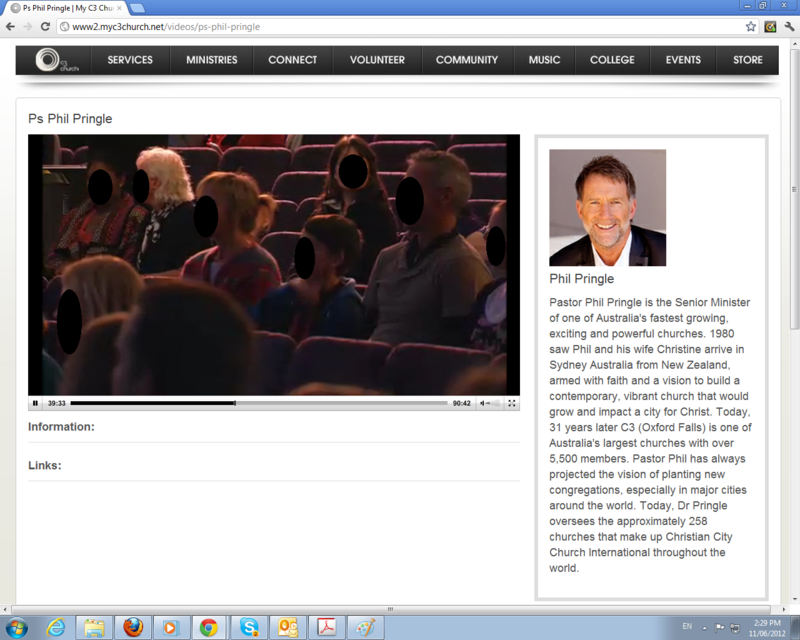 Either God is going to bring a national revival through C3 or Phil Pringle is a false prophet. 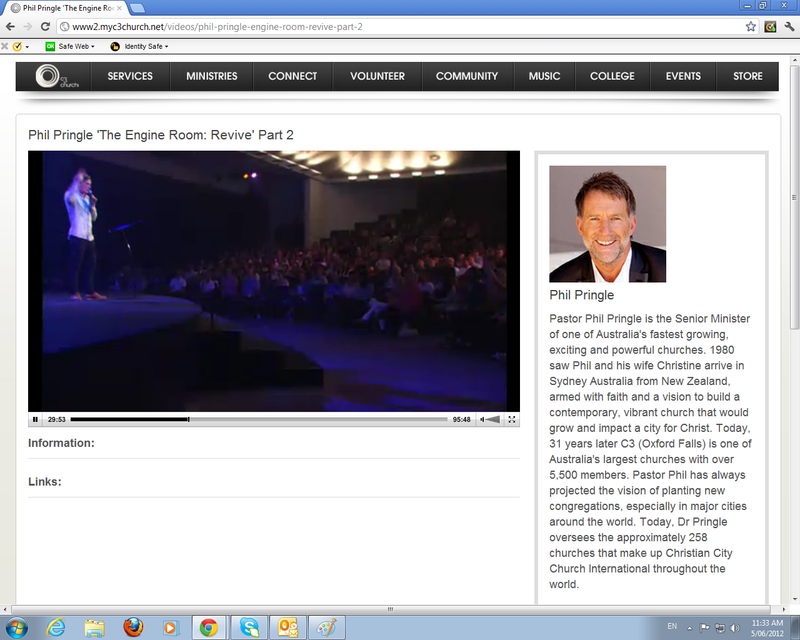 The following week on the Sunday morning, 25th of March, Pringle preached a sermon titled ‘The Engine Room: Connect’. C3 didn’t upload a sermon that night. But we figured if their was a revival in that meeting, they would have definitely filmed it to prove to every other church that their church was the one with God’s blessing. 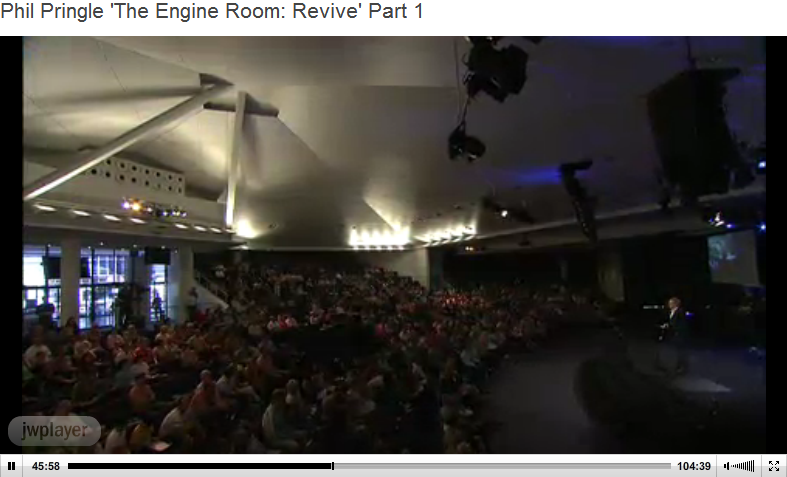 The following week on Sunday morning 1st of April 2012, the joke was on C3 as Pringle preached ‘The Engine Room: Revive’. There was still NO revival. That night while Pringle preached another sermon, seats were still empty (see them in the background). A month has passed and Presence Conference is about to hit C3… Was God going to show up at C3 Church so Presence could experience revival? It seems logical that if God was going to move, it would be before the before Presence Conference. Why? So the international audience can bring back ‘God’ to their country God. So there is no prophecy fufillment. None. But maybe God DID move after Presence Conference? 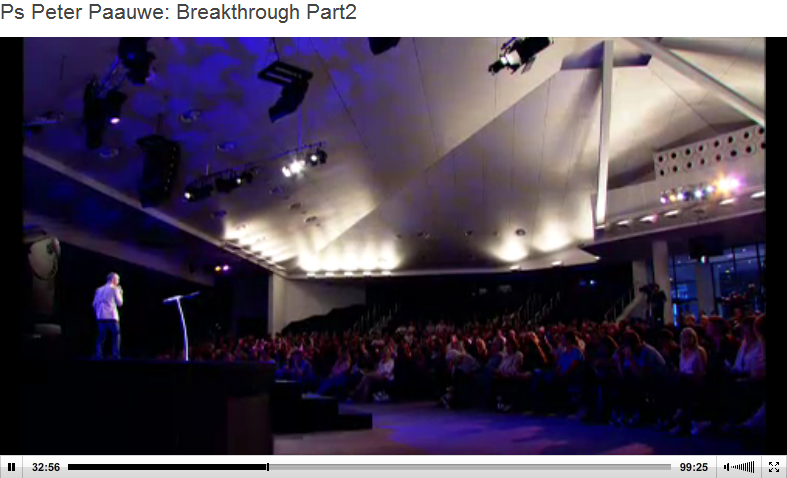 If you’ve seen footage from the Presence Conference scattered around C3 Church Watch, you know revival did not turn up. If revival broke out at C3 Presence Conference in Darling Harbour – then God would contradict himself in the prophecy as mentioned in Part 4. So was there going to be revival AFTER the Presence Conference? 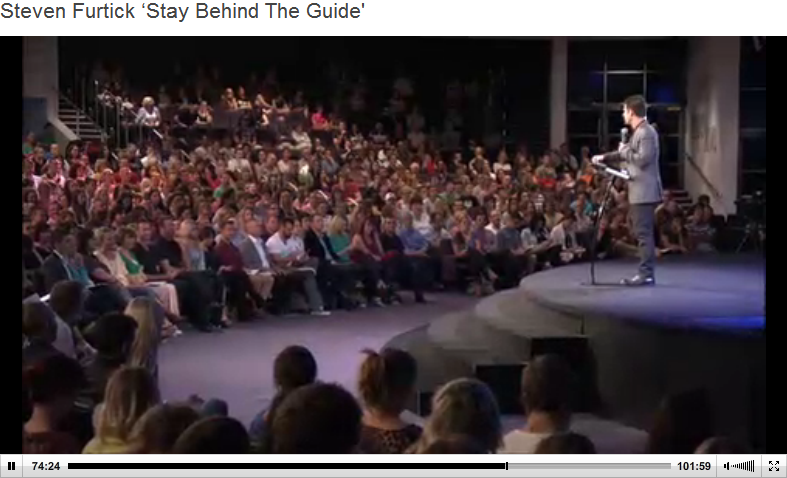 Steven Furtick preached that Sunday morning (15/04/2012), a message titled ‘Stay Behind The Guide’. You can see empty seats straight at the back of the auditorium. Nope. What about the night service? 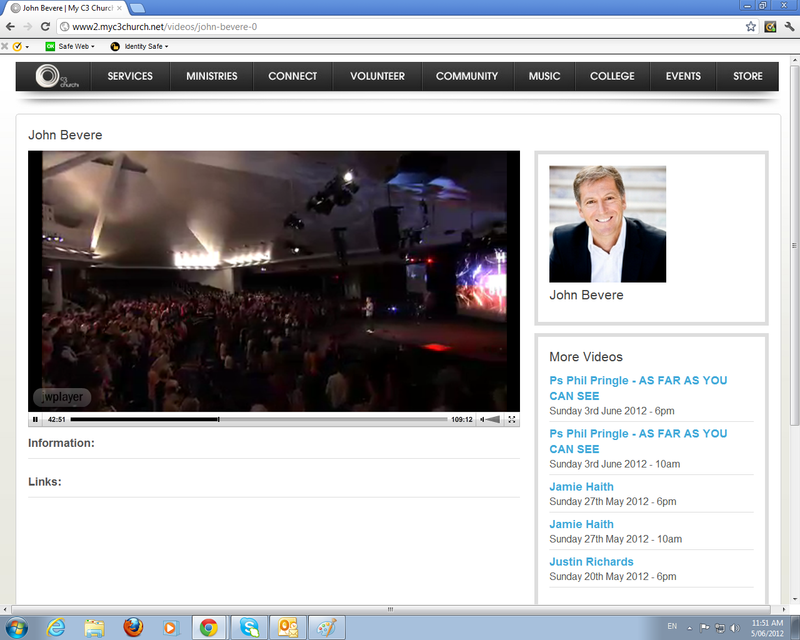 Did revival happen next Sunday morning (22/04/2012), while Pringle preached his sermon Connect? That’s also a lot of empty seats behind Pringle again. 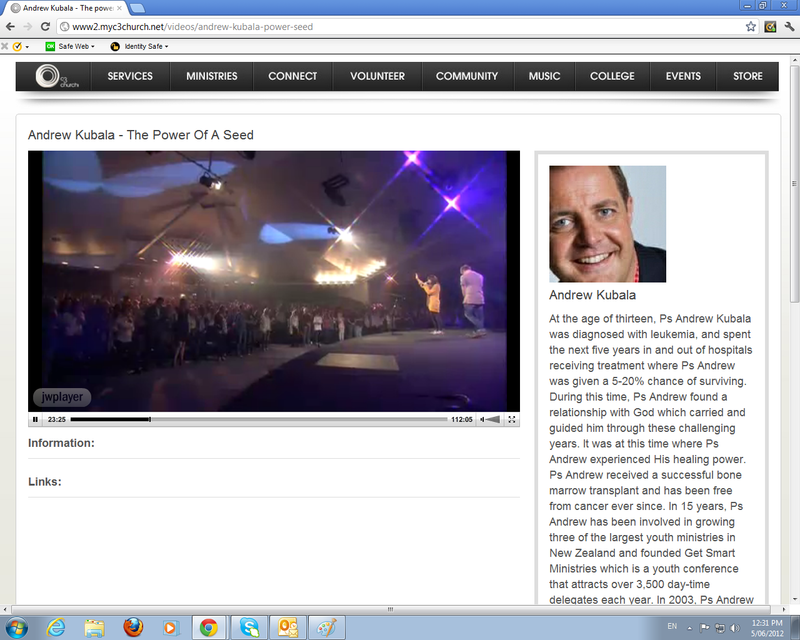 Did revival come when Andrew Kubala preached ‘The power of a seed‘? No. While the room is dark and smokey, if you look to the seat at back of the room, they are empty. More seats remained empty the following Sunday in Mark Kelsey’s sermon on the 29th of April. There was no revival. The night service that Sunday wasn’t full either. 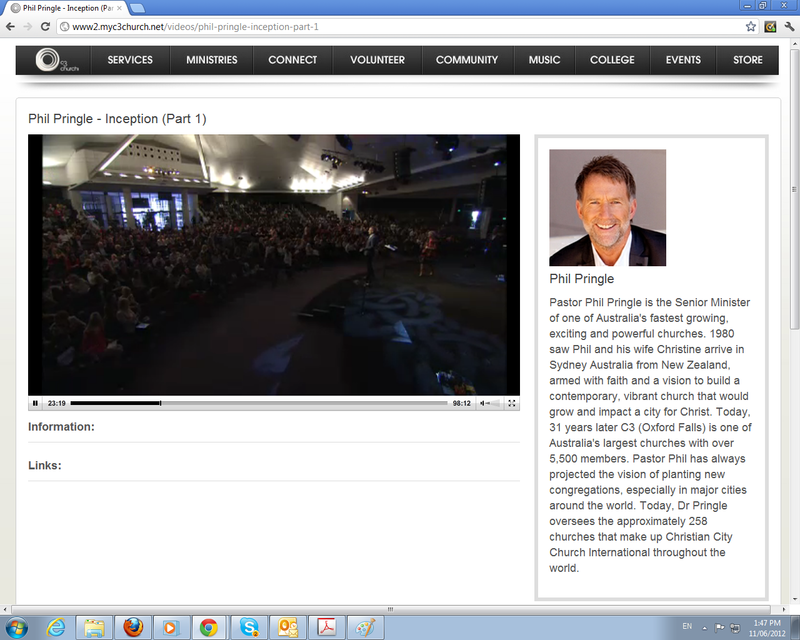 Pringle’s Inception movie sermon the following week on the 6th of May 2012, did not experience revival. In Pringle’s continuation on Inception that night… there was no revival to be seen. 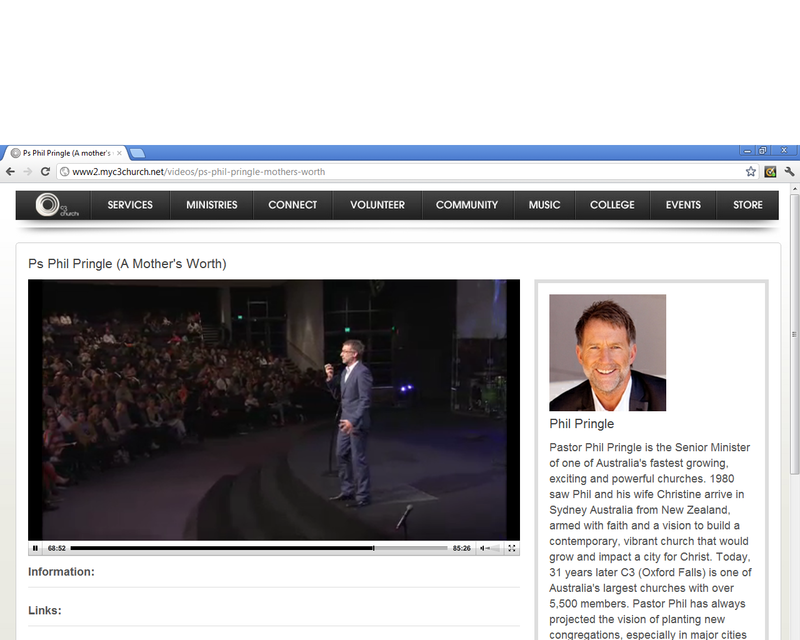 On mothers day on the 13th of May 2012, there was no revival while Pringle spoke on ‘A Mothers Worth‘. Even that night, there was no revival. 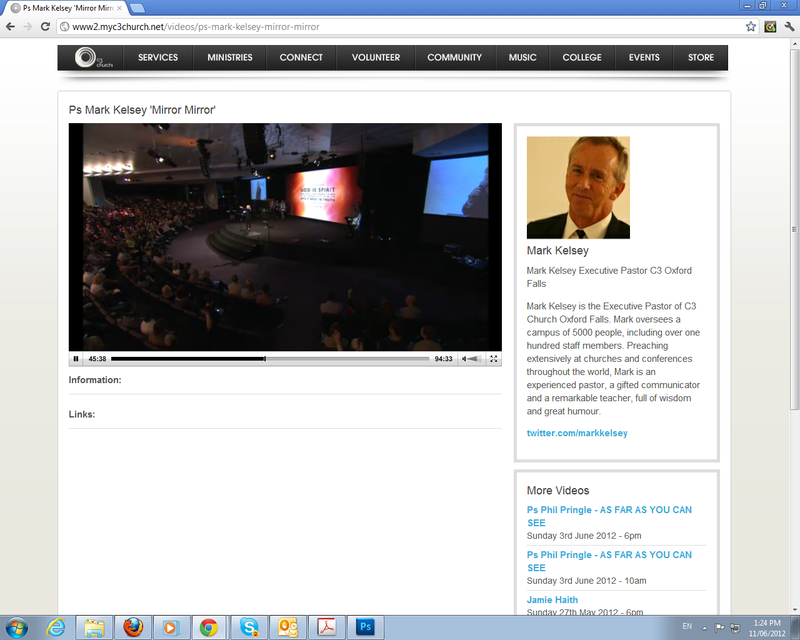 When Mark Kelsey got up the following week to speak Sunday morning on the 20/05/2012, there was no revival. However, he had this to say to the congregation in the giving message. Was he saying this because people were feeling cheated from Pringle’s false prophecy? Of course it’s not enough Mark Kelsey. Didn’t you hear what the “greatest pastor in the world” prophesied? Didn’t you hear yourself say “I get frustrated sometimes”? Why is Mark Kelsey chastising the sheep in his congregation when it is his prophet that prophesied falsely that revival was going to come? In spite of this, Justin Richards spoke that night. No revival. The following week (27th of May 2012), a speaker by the name of Jamie Haith, spoke at C3’s morning service… Where revival was still a no-show. Jamie Haith spoke that night where revival still refused to turn up. In the continuation of Pringle’s groom-a-thon that night, the storm of revival did not turn up. C3 said the dam overflowed on the 3rd of March. 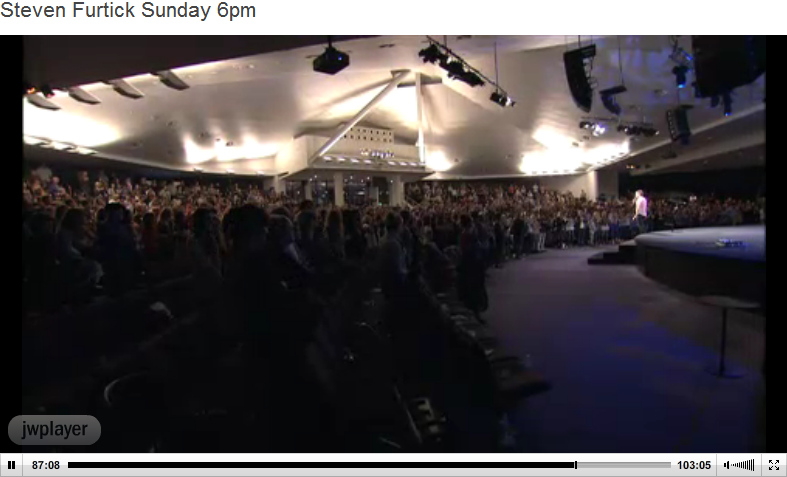 We have recorded the ‘spiritual’ status of each Sunday service to the 3rd of June. This is a three month period. God DID NOT say, “the power of God is gonna touch this city with revival”. God DID NOT say, “the Spirit of God is gonna fall on this nation”. God DID NOT say, “the power of God is gonna pour down out of heaven”. God DID NOT say, “If you will build my house, if you will commit yourselves and not give yourselves comfort but will build the house, I will fill this place with my glory”. God DID NOT say, “Every service you come, you will queue in line to be in the house of God”. This prophecy is a lie. A scam. We have thoroughly examined in all five articles that Phil Pringle prophesied falsely. There is no escape room for Pringle. Not only did he mislead his entire church, he mislead thousands of Christians around Sydney. 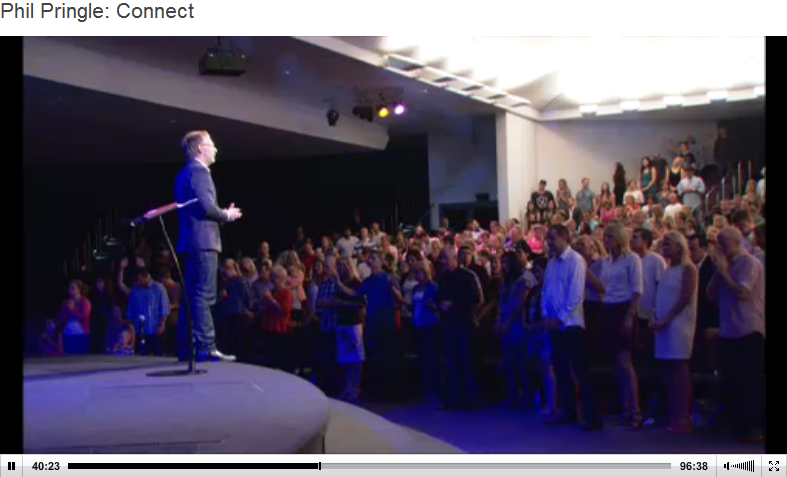 Not only did he also mislead thousands of Christians around Sydney but also across Australia. Not only did he deceive thousands of Christians across Australia, he also mislead thousands of Christians across the world who attended his Presence Conference 2012 and watched him falsely prophesy online. Part 1 – we looked at how C3 purposely distorted information at their Sydney Presence Conference, taking snippets and screen grabs fromNews Articles and blogs to portray the world as wrong and Phil Pringle as some Godly prophet. Part 2 – we looked at how C3 and Pringle mislead people to believe that God used Pringle against media and ‘false prophets’ to prophesy that the Warragamba Dam would be full again. We examined how C3 and Pringle used this prophecy twice to advertise and elevate their movement to Christians and churches locally and globally. We explored that it was highly likely that Pringle prophesied out of reaction against those he dislikes and pride. Part 3 – we looked at Pringle’s further insight to his Warragamba Dam prophecy to help us understand the actual prophecy itself and what he thought this meant. He informed us that C3 met the conditions God said through him so C3 can experience revival. Part 4 – we analysed the Warragamba Dam prophecy and proved it to be false. Part 5 – we examined every service for three months to see if revival would break out “immediately”. This was from the time Warragamba Dam overflowed (03/03/2012) to June (03/06/2012). We have proven that the prophecy has not come to pass with it’s promise of a revival. The right thing for Pringle to do is to humble himself, apologize and step down, admitting he has done Christianity a massive disservice. 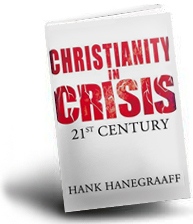 How many Christians will have their faith shaken or shipwrecked because C3 convinced them to put their faith and hope in the words of a false prophecy? We would like to know if any information in our articles is wrong. If you find any information that is misleading in our investigation of Phil Pringle’s false Warragambe Dam prophecy, please Contact us at c3churchwatch@hotmail.com. 0:30 Opens with a plug for the hundreds you can spend on the C3 schlock in the “Resource Center”. 0:35 Montage full of sappy music and all the “best lines” from the conference. These guys are like Woody from Toy Story where the same 10 lines come out over and over again if you just pull the string. Montage includes Phil Pringle working the crowd into frenzy so that they can feel some sort of glory cloud, or whatever, descend on them to make them sway and close their eyes and…. Ew! What is that?! 1:27 … Pulling out all the stops I see. Emaciated “Jesus” hanging on cross, live on stage in apparent agony. 3:20 Montage over. Phil Pringle on stage. 3:40 Phil and Laura (Not sure who Laura is in all this) say they’re not tired at all and ready to go for another week. I’m sure they’re just kidding Jake. Don’t have a heart attack. Doing some giveaways now to “delegates”? What are “delegates”? I don’t speak C3 I guess. 4:30 Ovation for the delegates/volunteers. Got it. Apparently part of their volunteer duties was to serve coffee and give hand massages and baklava to attendees in the TLC lounge. Teaching them about taking up the cross I guess… not! 5:28 Laura just announced 1000 already registered for next year. Rather than saying, “Cool, way to go!” Phil Pringle said, “That’s great! Let’s make it 3000 by the end of the night. What do you say?” Reminds me of my days in sales at Dell. They announce deadline for early registration end of May. Price doubles after then. And Phil is showing his great faith by announcing he is booking a bigger place. 7:23 Here is the carrot they used to get people to register today: attendees got their name in a drawing for the prizes. This first giveaway is four nights in a five-star hotel. $300 in spending money vouchers and VIP seats at next year’s conference. Yep, that’s the way to deny the flesh which wars against our spirit. 9:40 Steven Furtick takes the stage. 10:15 Immediately starts praising all the audience for their many worthy qualities. Scratch, scratch, scratch. 10:53 Gets big “Awww” from audience for confessing he missed his daughter’s first steps to be there. Should’ve stayed home, Steven. That’s time better spent. 11:33 Double-entendre. Just had to point out everything he misses being away from home and away from his wife. 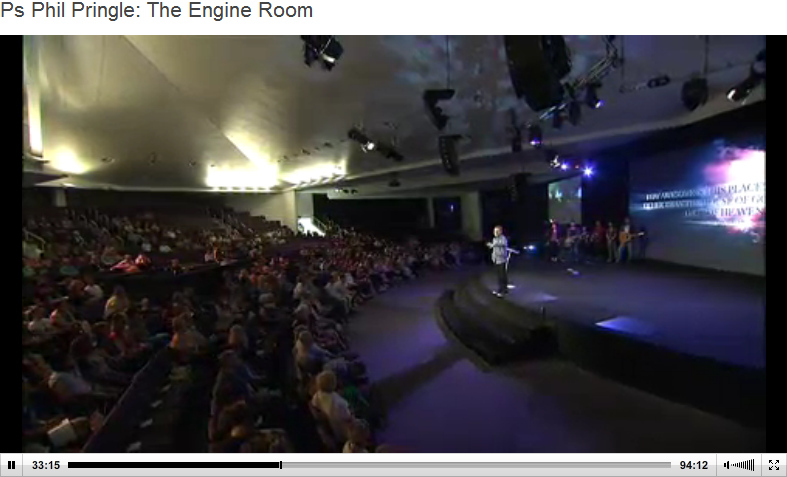 12:06 Cues the audience to applaud their Pastor Phil, and his wife, Chris… the… co-… pastor…? 12:31 ”I’ve been thinking, what do I say about ______, [since] it’s the last session of the conference.” That blank ought to be filled with Jesus or God, right? No, he was meditating on what he should say about Pastor Phil. I’m curious how long before I time stamp a new subject before he stops talking about him. He’s got to pay it forward since Steven himself was honored so well by the speakers at his own Code Orange [scheduled] Revival. 13:28 Just getting started honoring Phil with a pithy saying. “God is not the God of either/or; He’s the God of both/and.” Chapter? Verse? Where is that in Scripture? 14:10 Summary so far: Pastor Phil and Chris, both “fun and focused”. I don’t recall that in Paul’s list of qualifications for overseers. 14:15 ”Spirit-led and smart”. A rare quality indeed. Got anything about Jesus? God? Bible? Almost 15 minutes in here. 15:00 Still sucking up to Phil. Now he’s “brilliant”, but not in the underwhelming Aussie sense. Makes joke about the Australian overuse of “brilliant”. Phil has to keep this in mind later as you’ll see at the end. 15:50 Says “Let’s get to it” and grabs Bible. Any bets on how long it takes to read from it? 17:08 Segues back somehow to flattering Phil as well Bishop Dale Bronner (Word/Faith heretic), whom I predict he is about to quote. 17:30 ”Opening to Matthew 11:1-11″ he says… He’s reaching for the Bible and…. 17:40 Fail. Now telling the audience “The Lord wants to give someone the courage to act.” That’s definitely not in Matthew 11. 17:50 Instructing on how to tell you’ve caught a vision. Is there a fever involved? 18:00 Vision – Action = Daydream. Got it. Now Matthew 11? 20:00 Got to give Pastor Furtick props. He catches that Jesus had announced earlier in Matthew that he was to fulfill the prophecy that he would “set prisoners free” and that John may have been tempted to doubt since that wasn’t happening for him. Not many people bring that up. 20:30 He thought Shawshank Redemption was a warm and endearing picture of prison?! Has he seen the movie? 21:00 Stand-up Comic Interlude (From here forward to be cited as SUCI): “Some of you are sitting next to your disappointed expectation.” Already had one regarding the use of “brilliant” in Australia and regarding missing his wife. So the SUCI count is up to three. 21:38 Talking about Steven’s life now. 22:15 SUCI #4, but sort of fell flat. Win some, lose some. 23:00 Segue from Steven’s life to everyone else in audience now. Apparently we’ve all asked the question, “Is this it?” And you always need someone to encourage you. 23:50 Rest of passage he ends with “no one greater than John the Baptist” (and mumbles quickly yethteonewhoisleastinthekingdomofheavenisgreaterhthanhe…). Pastor Furtick says Jesus was giving John affirmation and encouragement. Strange. Neither John nor his disciples were even there to hear that. Talk about squishing a passage into a mold to fit your message. 25:50 Clears up that John’s disciples nor John were there. Where’s he going with this? 26:16 Seriously?? “It’s quite possible that Jesus has been talking about you… behind your back.” And may I say that’s some mighty wild speculation you’ve got going on there. Chapter? Verse? Scratch, scratch those itching ears. 28:00 ”Here’s my theory.” Okay, that’s not what you’re supposed to preach. [next breath] “1 Corinthians 2:5 says our faith shouldn’t rest in men’s wisdom but in God’s power… Maybe Jesus wanted John’s faith not to rest on how good John was doing, but in how good Jesus was.” Well, yes, that’s certainly true. Why did you say “maybe”? And what does this have to do with God talking behind our backs, and doesn’t obsessing about whether he is or not defeat Pastor Furtick’s own point he’s trying to make now about getting our eyes off of ourselves? 29:00 ”God takes away affirmation to take us to a place of deeper affirmation in the Spirit.” Pastor Furtick, how in the world are you extracting this from John 11? Audience loves it though. Scratch, scratch, scratch. 30:00 Steven is going to share three affirmative statements that he believes God might be saying behind your back. How in the world does it help me to speculate on what God might be saying behind my back? Wouldn’t it be wise to focus on what we know he already said to me in his Word?! 30:24 ”I felt like the Lord put on my heart to tell somebody today.” Oh now, it’s the Holy Ghost answering machine. God is having trouble getting through to people so he has enlisted the help of Steven Furtick. 30:44 Affirmation #1: “You’re doing better than you think you are.” (Please note in link to Pooh bear quote below that I personally think two of these three points are inspired more by Pooh than the Bible.) In Romans 12:3, am I not exhorted not to think of myself more highly than I ought but instead with sober judgment? 2 Corinthians 4:4 says that the god of this age has blinded the minds of unbelievers. Are you saying that our blindness is concerning not being able to see how good we are? But I guess I’d better make a way to get this to jibe with the rest of my Bible, because we’re adding a new book. Steven said this is the “Word of the Lord”. 31:50 ”But then you’ve got to tap into that place, when Jesus says to John…” So when I am feeling poorly about my own performance, I need to tap into what Jesus said about John? Wow, this is twisted logic. He’s saying that Jesus had a good reason for not saying these things to John’s face, but is encouraging us to imagine Jesus is saying them about us? So what he’s arguing would have produced inordinate pride in John, we’re somehow going to handle better? And how do you know that those to whom you speak are “doing better than they think”? What if I’m a complete screw up? What if I’m a heretic? What if I’m a serial killer? You have thousands, probably millions, watching this conference. Odds are that you are proclaiming this to some sociopaths of the highest order! 32:30 Long general string of general affirmations proclaiming how very wonderful everyone is in the room. Everyone’s now applauding. Scratch, scratch, scratch. And apparently, if you say it loud enough, it really makes it true. 33:00 Back to Steven’s life. “Pastor Mickey” did better than he thinks because he poured into Stephen when Steven was young and now Mickey is flying all over the world vicariously through Steven Furtick. I don’t know if Pastor Mickey’s going to be bragging about that one on Judgment Day. 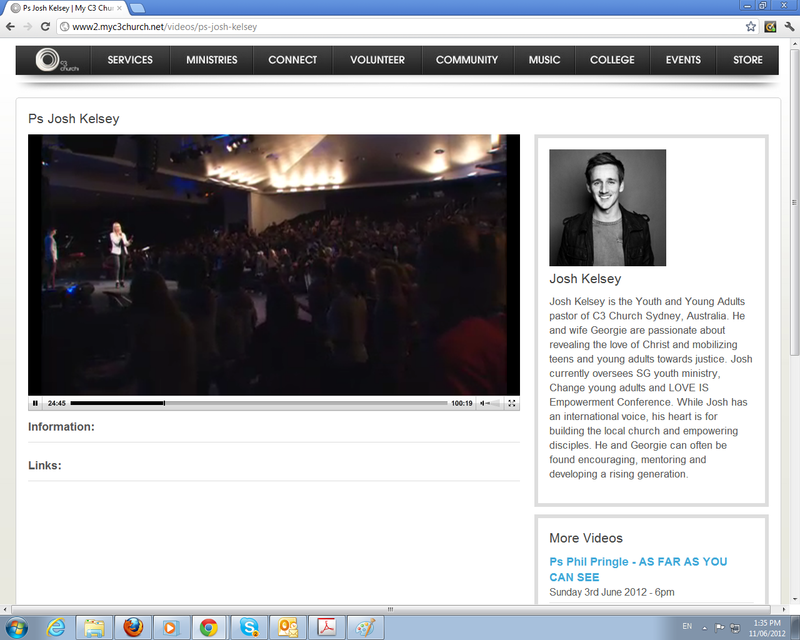 34:05 Called the audience a crowd of “world-changers”. Scratch, scratch, scratch. 33:22 SUCI #7 about teenagers being demon-possessed. I have a 14-year-old son and admit that’s actually kind of funny. 33:55 ”Find somebody and touch them and tell them, ‘You’re doing better than you think you are.’” There. My beagle is sleeping at my feet. I just told her. She’s duly affirmed and looks truly peaceful. But that’s actually is what she always looks like. Oh well. Don’t try this on a human, folks. You’ll do more damage than you think you will. 35:00 Getting loud and telling them to “clap by faith”. Really? 35:38 ”I get to preach a lot of places. You’re special!” Really, guys, tell me you’re not going to fall for that, are you? 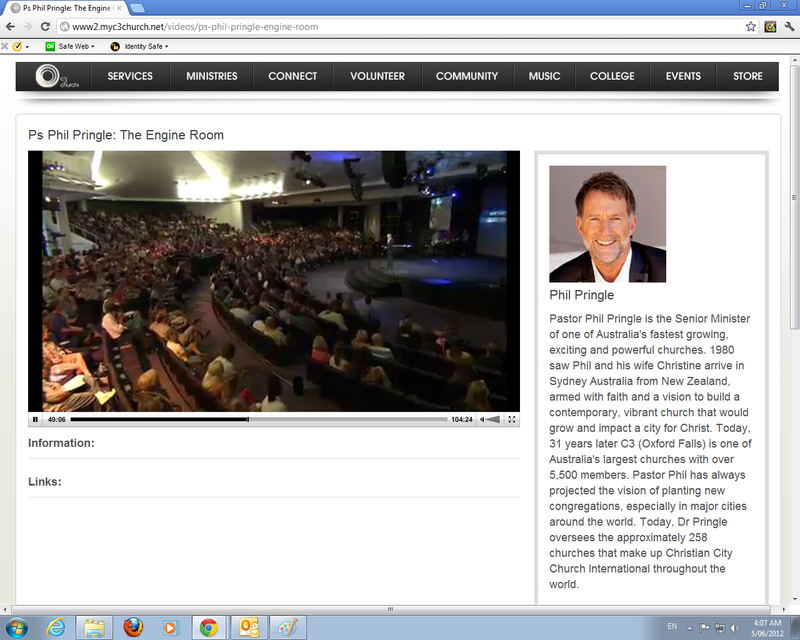 Now moving on to tell Phil Pringle how awesome his church is. 36:30 ”Please receive that from my heart.” He’s speaking of the encouragement, “You’re doing better than you think you are.” So is that from God or from your heart? Which is it? Then quotes but does not give reference. “It’s God’s kindness that leads you to repentance.” Tell us about that kindness please. Why is God so kind? How do we know it? Hint, you find it all in the Bible and it has nothing to do with self-affirmation but is seen on the cross, which actually only affirms our lost state and our need to be saved from our sins. 36:50 Affirmation #2: “You matter more than you think you do.” Scratch, scratch, scratch. 37:00 ”John felt completely discarded. I’m using a little bit of my imagination.” At least you admit it. But is that what you’re called to do as a pastor, to preach your imagination? Immediately also says, “Maybe, I’m reading a little too much into the text.” Yeeeeees. “That’s somebody in here [in the audience].” Bingo. You’ve just arrived at where you’re reading too much into the text. 37:25 Now talking about Steven’s childhood. Trading card story. 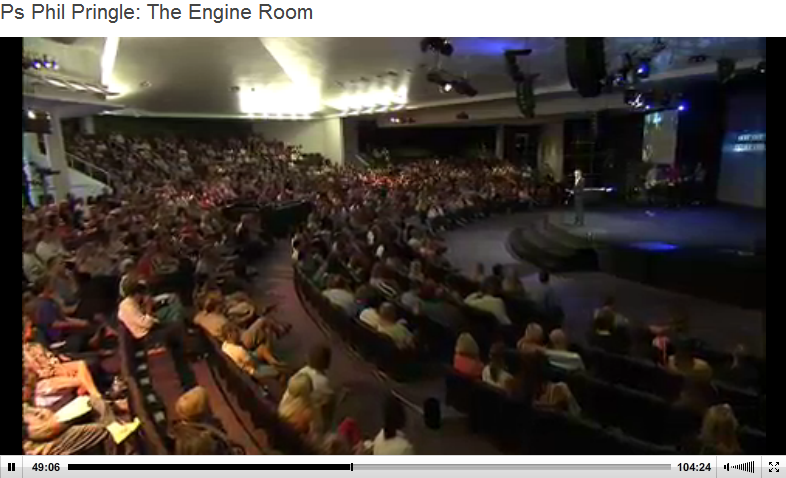 39:20 Now talking about our need to go into the “enemy’s camp to retrieve what you gave away too easily”. Wow, this is dangerous ground. Doesn’t this sound a lot like what Jesus did for us already? Where is he getting this from this passage?! 39:28 Assertion after assertion: “You can tell the value of something by the price that was paid for it.” Doesn’t that contradict the story he just told about the baseball cards. Steven didn’t pay much for them, thus disguising the value. And in our case, we are given value by the price paid for us on the Cross, but it doesn’t prove that we were valuable in the first place. 39:38 Steven just said Jesus’ blood was shed for us to prove our worth. /sigh/ Chapter? Verse? 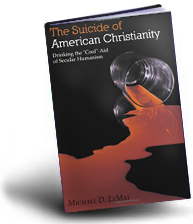 Got anything about our sin and the need for atonement? 39:45 ”You have infinite potential, in Jesus name!” Why does everyone keep tagging that onto the end of assertions as if it makes it better? It only makes it more blasphemous. 40:00 Launching into Code Orange testimonial of some sort; a horrible, sad story about boy who died in car accident while his parents were at revival. Ugh, It’s sounds like he turned that poor boy’s funeral into a Steven Furtick pep rally. He even made someone else’s funeral about him. Ick. 41:17 ”Do you want to know what I texted?” Actually, no. Can you tell us about the text in that beautiful leather-bound tome sitting useless on the podium there? 41:30 Story about God talking to him again. Put the bulletin from the funeral into the rocks in the valley where Joshua told the sun to stand still. Interesting. Take it from someone who knows. Pastor Furtick is carrying a whole lot of guilt over the fact that his parents were at his revival and not with their boy when he was killed in a car wreck. He’s acting like someone desperately trying to make some restitution. I know what it’s like to carry misplaced guilt over the death of a child and this man has it in spades. Pray for Pastor Furtick. I keep seeing signs of his heart softening in this sermon. I can’t put my finger on it, but…. something is just a bit different. 42:00 Oh dear, he is apparently trying to convince the parents that their son’s death “counted for something” and did make a difference, because people are starting Bible studies and such because of him. I have some personal experience with families who have lost children and this approach is usually not taken well. I could be wrong, but I’m pretty sure they don’t want to think God took their son to accomplish some purpose of his. But even if they did, it’s still probably not what they want to hear right after he dies. I understand what he’s trying to do, but I think it could be misguided. 43:00 ”I’m not leaving you [John] in that prison because I’ve forsaken you. I’m leaving you in that prison because you’re so strong; you’re so mighty!” May I point out the obvious here? Jesus left John in that prison because his purpose was not to free people in physical prisons but to free us from our Sin. He did not come to conquer the romans or Herod. He came to conquer death. 43:11 Again, he’s turning it around again to apply it to everyone listening to say that they are exactly like John the Baptist. 43:40 Affirmation (but not really) #3: “It’s less about you than you think it is.” Hmmmmmmm… Is he trying to get the Matt Chandler monkey off his back now? Trying to prove he doesn’t think the Bible is about himself? Wow, now he’s saying he had to throw that third point in there or you’ll “take this message the wrong way” and is taking the time to mock his first two points. This is one weird schizoid sermon! 44:20 ”Want you to leave this conference on affirmation overload, but we want it to be the right kind of affirmation, otherwise it will backfire.” Like giving ammunition to your critics? 44:45 Now quoting Hebrews 12: “Consider Jesus, who endured such hostility from sinners.” Encouraging the audience to step back and see there’s a bigger picture than your immediate surroundings. 45:40 ”Your dream is rotting in prison.” /gasp!/ Not that! 46:07 Obligatory sports analogy. Oh my goodness. Is he going to make Jesus, our advocate, the referee challenging the ruling on the field? That’s a terrible analogy. 47:25 ”This is going to be a turning point in someone’s life right now.” Maybe so, but for the better? 49:30 Whipping up crowd. Band getting louder. Girl in band jumping up and down with arms up in the air, reminding me of high school pep rallies. 49:57 ”In His Presence, anything is possible!” Chapter? Verse? Crowd now “shouting to God with a voice of triumph.” What are they triumphing over and based on what? 50:40 Wants to pray for specific people. “If you know God is speaking this message specifically to you… shoot your hand in the air and let me pray for you.” What do you want to bet these are going to get carefully counted as people making decisions for Jesus to boost those stats? And upon what are they basing their belief that God is speaking this message to them? Their gut feeling? 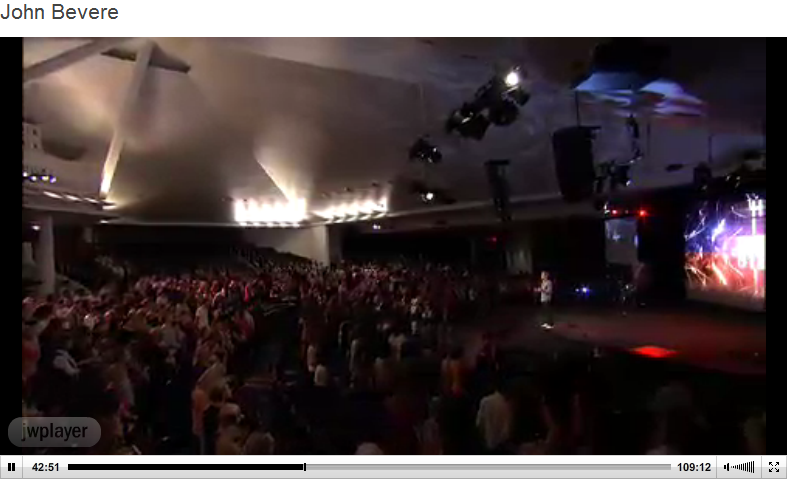 51:05 Making “positive confession” over the people with hands raised via recap of three points of message. “His grace is available to anyone who will repent and believe. That’s it.” (Repent… from… what?! It’s like you’ve given someone the news the Governor commuted their death sentence and they didn’t even know they’d been convicted of a crime!) “To completely trust him with your life, place your faith in him.” No, placing your faith in him is not so much “trusting him with your life” as trust in His life, death and resurrection. I am not capable of perfectly trusting God with my life. “By Grace you are Saved” (Pulled from context) “If you know you are not in a right relationship with the Lord tonight…” How would they know that? Y’all have done everything there at C3 to make sure that they feel “in tune with God” complete with altered state of consciousness that probably results from the loud repetitive music and rhythmic mantras Furtick cheered from the stage. 55:00 Asking crowd to shoot their hand in the air on the count of three (while eyes are still closed) to say they prayed that prayer. Saying he’s not trying to emotionally manipulate. Asks those with hands up to come forward to… altar? There’s an altar? I just see a stage. No manipulation? 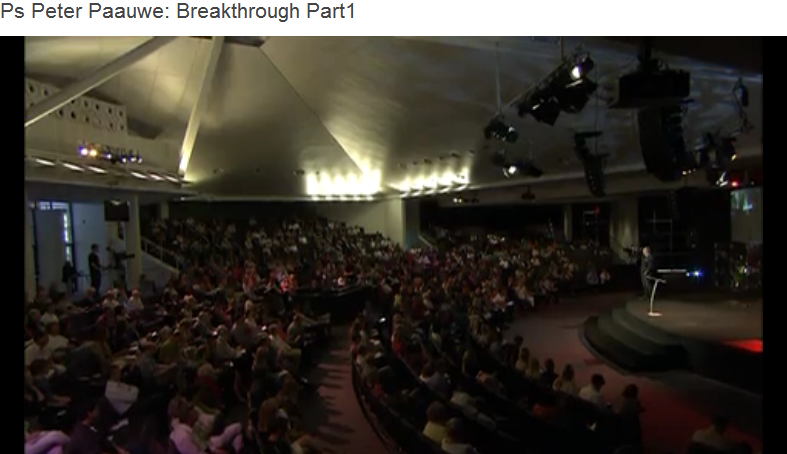 Furtick keeps prompting and flattering those who come forward for their boldness and the music is continuing to swell. 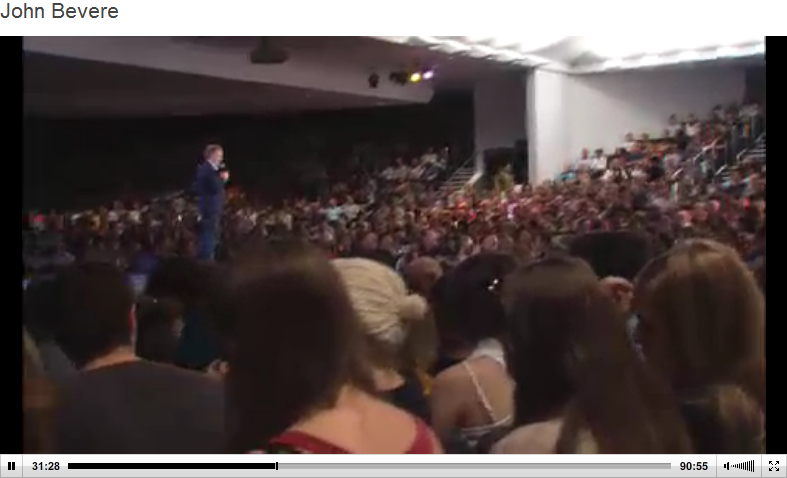 57:05 Starts addressing people who have come forward regarding their “decision” and picks up Bible and tucks under arm. Interesting. Maybe he is just preparing for his exit of the stage. But he takes his Bible. Where’s his tablet he was using? I think that’s still on stage. Fixed his attention on a particular teen crying next to stage and asking, still rhythmically, why he’s crying. He just wants to be happy. He starts naming, still rhythmically, all the people that are near the stage that love him and that “we all love you. You matter more than you think.” Again addressing another teen. Boy this guy is good. I am mesmerized and I can’t stand the guy. 1:00 Phil Pringle starts singing Beatle’s song for no reason whatsoever, other than the kid saying he’s 17 and the age mentioned in the Beatle’s song is 17. Again, with a soft mesmerizing voice. Then talks to another teen. Why is he picking all the teens? Is that all that came forward? Telling him to stick to his decision, don’t let his friends drag him of. “You’re strong. A very powerful young man.” Mesmerizing, mesmerizing. I’m blissed out just listening to this. The dude freaks me out. How many more minutes of this? I might be catching a plane to Sidney if I’m not careful. Won’t bore you, more of the same. Only addresses the young people that came forward. “Do you feel different after praying that prayer? How do you feel? You feel incredible?! There’s a cartoon called The Incredibles, isn’t there?” How hip and relevant for you to know that, Phil. “They’re powerful. You’re more powerful.” And this imitator of C.S. Lewis’ green witch continued to mesmerize them. We need the stench of Puddleglum’s burning flesh to wake us up here. Wow. Now flattering a 12-year-old saying he thought he was 18. “Are you a good boy? … Isn’t that nice… you look like a good boy. God’s proud of you. He’s very happy you’re out here tonight.” Wow. He’s now telling them about the “born-again motor” that’s been put inside of them to empower them to do all the things that God wants them to do. Wow, that’s a new one. Haven’t heard that one before. 1:05:25 Fail! Phil Pringle just calls one of his staff members by the wrong name when he calls her up on stage to tell everyone up front to follow her out. Then spends time flattering her to make up for the fact that he forgot her name. She seems to swallow it, laps it up. Ugh! 1:07:15 Band whipping things up again. Crowd goes while. Phil thanks crowd and tells them they’re “stellar”. He pauses before “stellar” because he probably wants to avoid “brilliant” since Steven Furtick so perceptively pointed out that that word has little meaning in Australia. So he pauses before “amazing” too. Probably a little irritated that Steven narrowed his already limited vocabulary of flattery, which he’s doing now, continuing to flatter the crowd. Scratch, scratch, scratch. Just announced a painting (found out later Phil Pringle is selling his own paintings. People ting they’re anointed or something.) is up to $30,000 (silent auction? ), announced by Laura. Nice. So glad y’all are making even more money than you’ve already raked in tonight. Talking up next year’s conference, register now. Brags about 21-day fast they went on before this conference. Okay, gladly that’s all. But I should insert one last disturbing note. I was informed by my friend Mr. Jake Elliot that this particular sermon was actually the bright spot in the whole conference. It was downright orthodox in comparison with what the other speakers put out there the rest of the week. And here is the Pooh Bear Clip I promised. I couldn’t help but be thinking of this particular clip and wondering if this is more where Steven Furtick got the inspiration for this sermon, more so than the Bible. “… I’m going to be playing the audio from a video segment where they are- where Phil Pringle is basically getting people geared up to give for a miracle offering. Give money and you’ll receive a miracle. It’s – I mean it is- so, so blatantly obvious and just terrible as to how they are, you know, fleecing the people attending the Presence Conference! And using God as the pretense for it. It’s- it’s- uh-ah-ih- I don’t even want to say it borders on criminal. I think it’s flat-out criminal. I can’t see that this is not a crime in the Kingdom of God, what these men are doing. 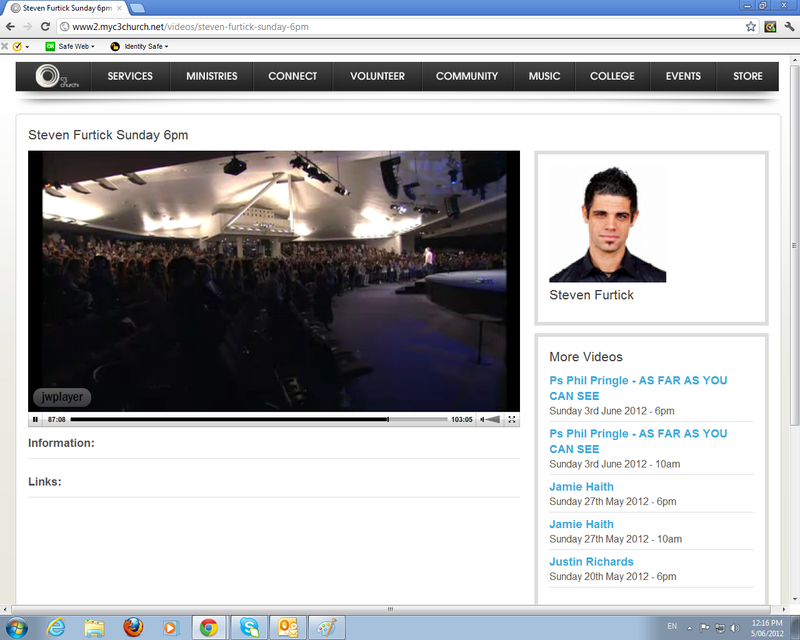 Steven Furtick and Phil Pringle, both.” – Chris Rosebrough, Fighting For The Faith, http://004f597.netsolhost.com/fftf/F4F041312.mp3, (8:20), 13/04/2012. “No! Elisha did NOT tell her to give. Not one red cent. 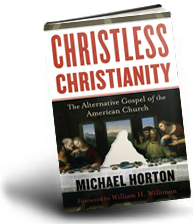 He just lied and blasphemed the name of the one-true God by mis-using his Word, to pimp this people for money.” – Chris Rosebrough, Fighting For The Faith, http://004f597.netsolhost.com/fftf/F4F041312.mp3, (48:30), 13/04/2012. Rosebrough correctly points out that Elisha asked the woman what was in her house. She said she had the oil. But Rosebrough points that she never gave that oil to Elisha. Instead he instructs her to keep the oil, get large containers and start filling. She was blessed with a miracle. A gift of grace. She did not give to get. 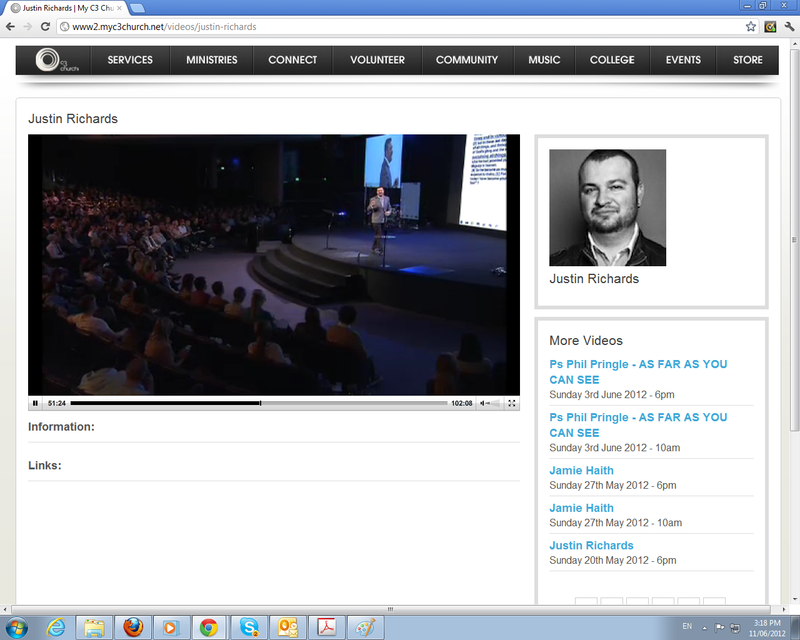 “Steven Furtick is prosperity pimping here, priming the financial pump for Phil Pringle and the Presence Conference. And he’s doing it by mangling God’s Word.” – Chris Rosebrough, Fighting For The Faith, http://004f597.netsolhost.com/fftf/F4F041312.mp3, (46:48), 13/04/2012. “This is a con-job.” – Chris Rosebrough, Fighting For The Faith, http://004f597.netsolhost.com/fftf/F4F041312.mp3, (52:20), 13/04/2012. “Did you hear that sentence? “I’ve got many things from God that money can’t buy but it started with what I had.” Money. BUY-YOUR-MIRACLE. This isn’t Christianity. This isn’t God, the Holy Spirit speaking through Steven Furtick. That’s a different spirit.” – Chris Rosebrough, Fighting For The Faith, http://004f597.netsolhost.com/fftf/F4F041312.mp3, (53:40), 13/04/2012. “Steven Furtick has turned into a full-blown prosperity pimp, twisting God’s word and priming you know people to give large amounts of money. He’s a now a studious student of the a prosperity pimp, known as Phil Pringle down there in Australia. This is not Christianity. You can’t buy miracles from God. 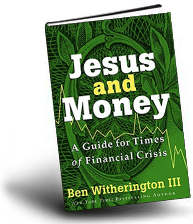 In fact, scripture talks specifically about those who would try to buy miracles from God.” – Chris Rosebrough, Fighting For The Faith, http://004f597.netsolhost.com/fftf/F4F041312.mp3, (1:03:52), 13/04/2012. “These people think that they can BUY God’s gifts. Buy. BUY! Purchase God’s miracles. And what’s happened here is that Phil Pringle and Kong Hee and John Bevere and Steven Furtick- well they’ve turned themselves into- well, miracle men who can perform miracles or give miracles for a price. Just give money to them and God will somehow will be impressed. And they can purchase these wonderful gifts of God. God’s mercies and promises can’t be purchased. It shows that, well, Steven Furtick ‘n Kong Hee ‘n Phil Pringle… Well, they’re no different- NO different than Simon the Sorcerer. In fact, I think Peter’s words to Simon the Sorcerer apply perfectly to men like Phil Pringle, Steven Furtick and Kong Hee: “May your silver perish with you because you thought you could obtain the gift of God with money. You have neither part nor lot in this matter for your heart is not right before God. Repent therefore of this wickedness of yours and pray to the Lord if possible the intent of your heart may be forgiven you. For you are in the gall of bitterness and in the bond of iniquity”. That’s right. That’s right – it applies.” – Chris Rosebrough, Fighting For The Faith, http://004f597.netsolhost.com/fftf/F4F041312.mp3, (1:06:45), 13/04/2012. 1. Who has proven to be worthy in handling the teachings of God correctly? 2. Who represents the counsel and person of our Lord Jesus accurately? 3. Who then should have a higher or more respected position to judge rightly and correctly? So far, Pringle unfortunately has proven again and again incompetence in handling God’s Word on C3ChurchWatch (please browse the archives). Unfortunately, Kong Hee, Steven Furtick, Phil Pringle and John Bevere have disqualified themselves as teachers of Jesus Christ with their dishonesty, bad conduct, bad teaching methods and woeful scripture handling. Is The Presence Conference Inviting Dishonest Men To Take Advantage of People? If you feel lead, please pray for the C3 Church Movement and the speakers at this Presence Conference. Please also pray for the victims who may have suffered from this ungodly teaching. Jesus said “seek first the kingdom of God and his righteousness” (Matt 6:33) and NOT, “seek first 30, 000 easter eggs.” C3 Church came up with an ‘innovative’ way to market and celebrate Christmas this year at their church. 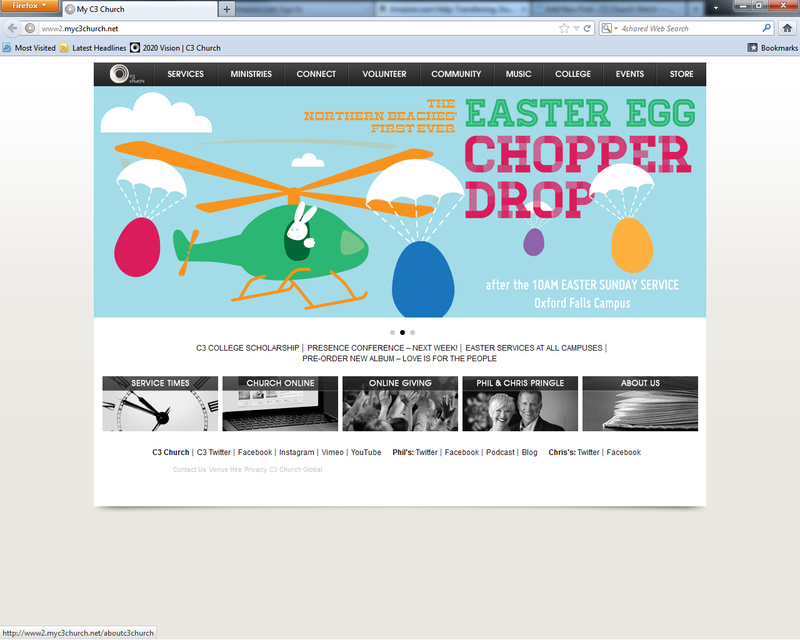 Their website advertised an ‘Easter Egg Chopper Drop’. The C3 Church had attached to the central picture a link to this pdf. The ones who didn’t laugh in our face must have been laughing behind our backs. And with good reason, mind you. It was a dumb idea, and it shouldn’t have worked. Last Easter, with a fledgling 2 month old congregation of about 200, we pulled off an Easter event that made headlines. It involved 50,000 Easter Eggs falling from the sky and thousands of dollars in prizes. No one went to the hospital. No drunk moms pulled each other’s hair out fighting over the prize winning eggs. We’re here to play ball. Happy Easter Charlotte. We’re going to do it again this year. The 2nd Annual Elevation Egg Drop. Bigger and better than before. BONUS: This year, we’ve already heard of at least a dozen other churches who are going to do the event in their own cities. We’ve been able to help many of them. Thankful that our stupidity is contagious and is going to help lots of other churches reach their communities with their unique (and hopefully better) versions of this Easter Egg Hunt on steroids. I remember more than one pastor telling me what an unwise move it was. It had never been done before, and it could flop. True, but it could also not flop. It could be a monster success, and possibly even catch on all over the country. Don’t you think every mammoth concept was downright laughable until it was a reality? Inherent in any vision that has the possibility of really taking off is the possibility of really tanking, right? Do you even think that maybe if people aren’t laughing at your ideas, you aren’t dreaming big enough? Abraham and Sarah laughed at God’s idea. Not a good move, guys. The more the idea makes you laugh, the better the chance it’s from God. If it fails, laugh even harder and learn something from it. If it succeeds, laugh at that too. Because you know that without the blessing of God you would truly be a laughingstock. If it isn’t worth laughing at, is it really worth doing?” – Steven Furtick, http://www.stevenfurtick.com/elevation/let-%E2%80%98em-laugh/, 23/03/2007. So why is C3 Church doing this then? 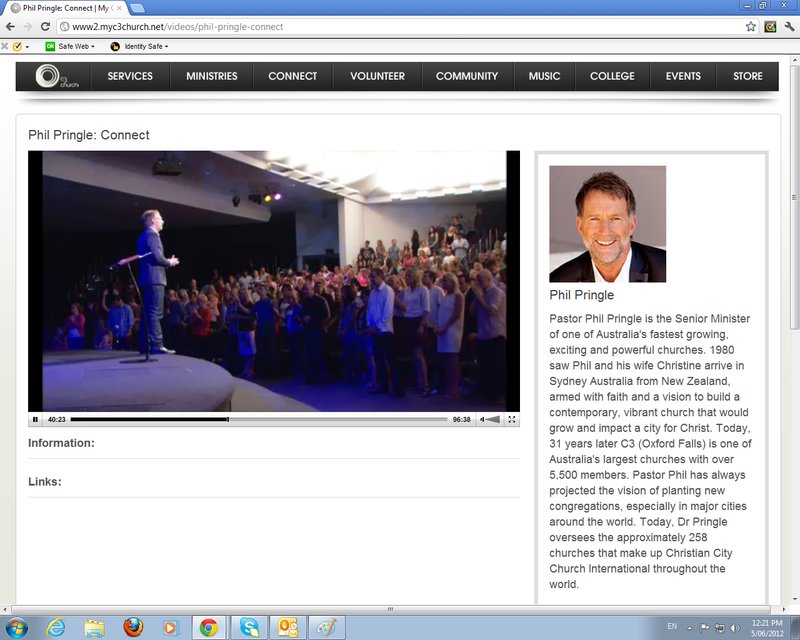 This is simply another form of advertising for Phil Pringle’s Presence Conference. In relation to this advert, another add pops up on the myc3church.net. 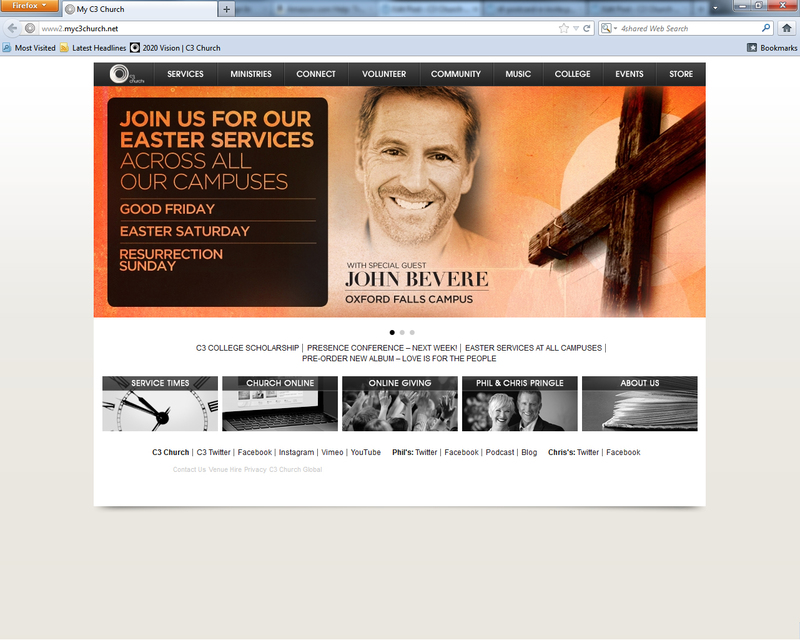 A massive advert for John bevere attending the C3 Oxford Falls easter services. What’s So Severe About Bevere? Again, we must ask why C3 is continually promoting these delusional cult-like speakers through their manipulative marketing techniques. Why do they want to be associated with these cult-like messiahs and ‘anointed ones’ who preach false messages and gospels?